The Non-filers Monitoring System (NMS) aims to identify and monitor persons who enter into high value transactions and have potential tax liabilities but have still not filed their tax returns. Analysis was carried out to identify non-filers about whom specific information was available in the database of the Department. The sources of information include Statement of Financial Transactions (SFT), Tax Deduction at Source (TDS), Tax Collection at Source (TCS), information about foreign remittances, exports and imports data etc. Data analysis has identified several potential non-filers who have carried out high value transactions in Financial Year 2017-18 but have still not filed Income Tax Return for Assessment Year 2018-19 (relating to FY 2017-18). The Department has enabled e-verification of these NMS cases to reduce the compliance cost for taxpayers by soliciting their response online. It is reiterated that there is no need to visit any Income Tax office for submitting response, as the entire process is to be completed online. 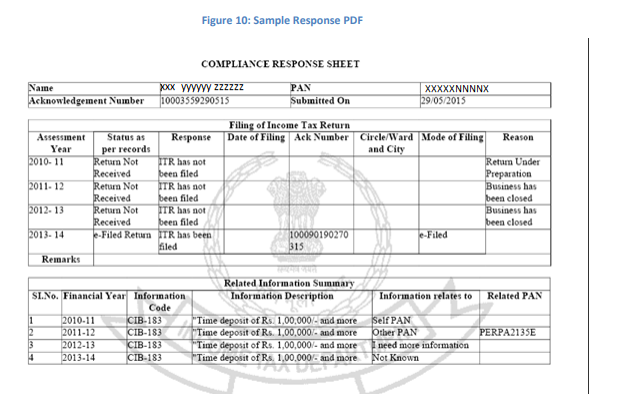 Taxpayers can access information related to their case from the „Compliance portal‟ which is accessible through the e-filing portal of the Department at https://incometaxindiaefiling.gov.in. The PAN holder should submit the response electronically on the Compliance Portal and keep a printout of the submitted response for record purposes. 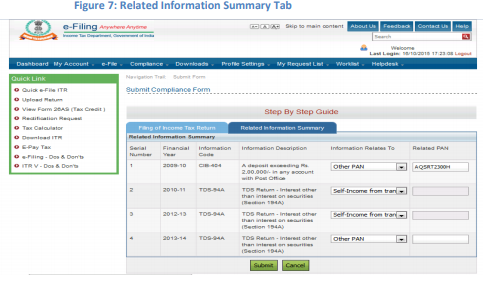 User Guide and FAQs are provided under the “Resources” menu on Compliance Portal. (Surabhi Ahluwalia) Commissioner of Income Tax (Media & Technical Policy) Official Spokesperson, CBDT. 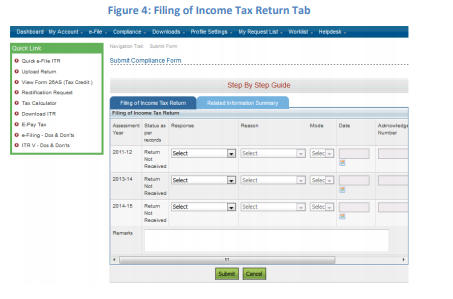 Step 1: Login to e-filing portal :Login to e-filing portal at https://incometaxindiaefilling.gov.in and click on “Compliance Tab”. 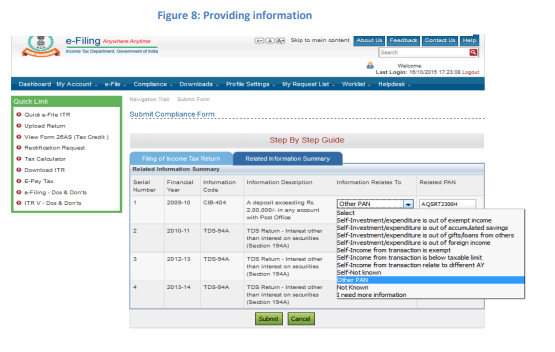 Step 2: View Non-filers information :Non-filers Information and Information summary can be viewed under Compliance tab. 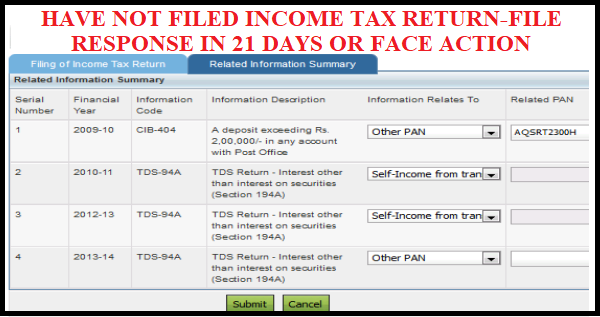 Step 3: Submit online response : Submit online response (Follow Step by Step Guide to submit response of non-filing of IT return). The taxpayer just needs to visit the e-filing website and log in with their user-ID and password for the e-filing portal. In case if the taxpayer is not already registered, it may easily get registered. The taxpayer will be provided the information about the third party information received by the ITD. i. 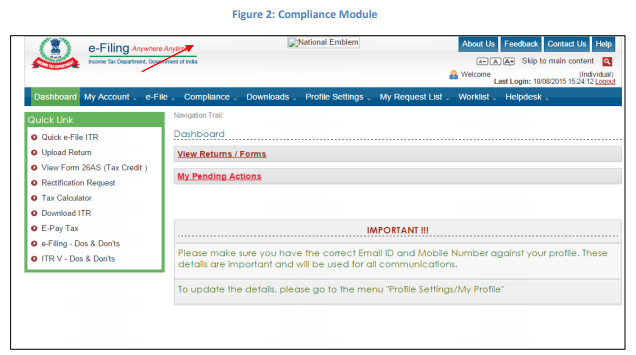 On dashboard, you will see a tab of “Compliance”. Click on the same. Figure 2: Compliance Module ii. 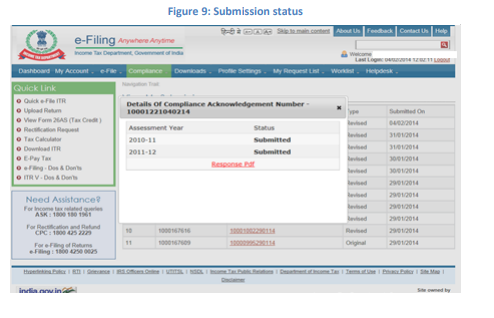 Click on “View and Submit Compliance” or “View my submission” link. View and Submit Compliance: This may be selected when taxpayer wants to freshly enter the response. View my Submission: This link will allow taxpayer to view the response which has been previously entered. The user can take the print out of previously generated response for their record. ix. Other PAN: This option is to be selected if the third party information relate to another taxpayer. In this case, the PAN of such other taxpayer is to be mandatorily provided. x. Not Known: This option is to be selected if the taxpayer has no information about the third party information. 5.3. 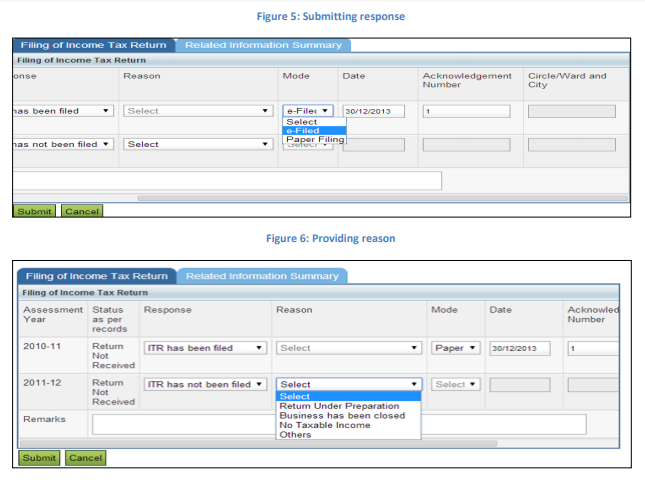 Submission of response “Submit” button will allow user to submit the response, after submission, taxpayer can take a printout of the submitted response for their own record. 5.4. Keeping record of submission The taxpayer can take a printout of the submitted response for record. 6. Processing of Response The responses submitted online by the taxpayers will be verified by the ITD and if found satisfactory, the case will be closed. The taxpayer can check the updated status by logging in to the e-filing portal. In case the taxpayer does not file Income Tax return, the information will be pushed to the field formation for further action.